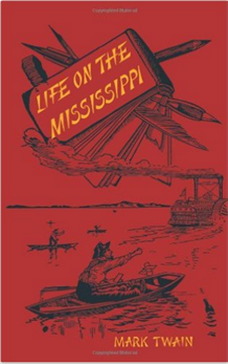 Life on the Mississippi is Mark Twain’s nonfiction book about the Mississippi River. Sort of. Although part history, part memoir, part travel account, it also includes a chapter from The Adventures of Huckleberry Finn, some folk tales, and many tall tales. So, it’s not just nonfiction. And not the best of Twain. Twain begins with a few chapters about the history of the river’s discovery and exploration by Europeans. These first chapters are followed by reminiscences of Twain’s life as a boy along the river (including the excerpt about Huck) and his career as a riverboat pilot, including a description of what is involved in learning to navigate the river. This section takes up about half the book, by far the best half. From there, the book loses focus, and if the kitchen sink had anything to do with the Mississippi, it would be in there. The last half of the book is supposedly centered around a trip Twain takes down the river to New Orleans and all the way back up to Minnesota. It describes the people he encounters and the towns he visits during his journey, 20 years after his time as a pilot. But it also goes off an every manner of digression and tells many anecdotes, some of which are frankly corny and a few of which are offensive these days. I don’t want to make too much of this because it is judging a book unfairly by the standards of another time, but some of the pictures especially, reprints of those that appeared in the 1883 version, are insulting to African-Americans. Finally, my edition, a replica by Dover, was loaded with typos, especially in the last half. I can only hope that the errors weren’t really in the originally published edition. 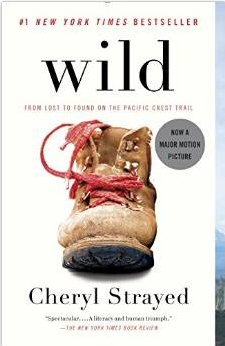 I didn’t actually become interested in reading Wild until I saw the terrific movie adaptation. That and a few excellent reviews changed my mind about reading it. There was just something about the author having changed her name to Cheryl Strayed that annoyed me, to be honest, and was keeping me away from the book. If you have seen the movie, it is amazingly similar to the book, only changing the sequence of some events and leaving a few things out. This memoir is about Cheryl Strayed’s attempt to get her life back on track by hiking the Pacific Crest Trail from Southern California to near Portland, Oregon. After Cheryl’s mother’s death from cancer several years before, her life fell apart. She became promiscuous and eventually began using heroin. After she and her husband divorced, she decided to hike the trail alone in an attempt to return to her true self. Although Cheryl views herself as an outdoorsy girl, she soon finds that she is unprepared for the rigors of the journey. Her pack is so heavy that she can barely lift it, her boots uncomfortable, she herself not in condition and not understanding that such an endeavor is painful even for an experienced hiker. She originally planned to hike about 20 miles a day but finds herself only making 6 to 8 miles, less at the beginning. This memoir is vividly written and quite harrowing at times as it follows Strayed’s journey. She encounters snow and landslides, wild animals, friendly as well as scary people, and her own truth. Wild is an interesting journey into the wild and into self-awareness. In December 1933, eighteen-year-old Patrick Leigh Fermor began a journey on foot from Holland to Istanbul. Last year I reviewed the two books that cover the first two legs of the journey, A Time of Gifts and Between the Woods and the Water, but had to wait until this third volume was published to finish the journey. Unfortunately, Leigh Fermor never completed this book. He actually began writing it first, about ten years after his journey, but stalled. Many years later he wrote the other two books and finally returned to this one. The editors explain in the introduction that they had to piece bits of it together from the manuscript, one of his surviving diaries (others were lost), and other documents. They did a great job, for it only seems fragmentary for a few pages in the middle. This travelogue picks up at the Iron Gates by the Danube in Rumania but almost immediately moves to Bulgaria. Leigh Fermor spends a great deal of the book traipsing around the Bulgarian countryside meeting colorful characters before abruptly deciding to go to Bucharest. As most of this section of the book is written from his memories of what happened because of his lost diaries, I can only say that his memory must have been remarkable. He writes in a vividly descriptive style, allowing you to imagine yourself along on his trip through a world that is long gone. It is remarkable also that almost everywhere on this journey he meets with kindness and hospitality. Only one night as he miserably hobbled along in Bulgaria after his foot was rubbed all day by a boot nail were his requests for a ride on two different passing wagons met with demands for money. Since he was living on a pound a week, wired periodically by his parents, he chose to walk. That same night his appeal for shelter at one house met no response from inhabitants who were clearly home. But farther down the road some charcoal burners cheerfully took him in. Only at all disappointing is his description, which is almost nonexistent, of Istanbul. (He persists in calling it Constantinople.) I can only suppose his visit was in some way spoiled, as it is clear from his comments on the way there that he had romantic notions of the East. A footnote repeats his remark that he never left Constantinople without a lightening of the heart. Leigh Fermor’s book ends where his green diary picks up, with his travels all over Mount Athos, Greece’s Holy Mountain. There he visited one Eastern Orthodox monastery after another. This section is fascinating for its glimpses into this unusual mode of life. Fermor came to love Greece so much that he lived there much of his life, and this was his first experience of it. I actually found this book easier to read than the other two more polished efforts, as enjoyable as they are. I think it is because it was written by his younger self. For although he was kicked out of prep school before this journey and never returned to a formal education, he plainly was frightfully well read and knowledgeable and constantly lost me in the earlier books with classical or poetic allusions that I was too lazy to look up. Apparently Leigh Fermor, who was clearly adventurous, went on to live an exciting life. I have a biography of him waiting for me in my pile. 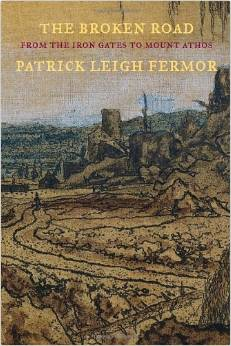 If you have read my reviews of Leigh Fermor’s other books, you may have noticed a discrepancy. In those I say he was nineteen at the beginning of his adventures. Well, that’s what he said, but since he celebrated his 20th birthday at a monastery in February 1935 and started his journey in December more than a year before, even I can do the math. I did notice him referring to himself as twenty before he actually turned it, so that’s probably what happened in the earlier books. In December 1933, 19-year-old Patrick Leigh Fermor set out to walk from Amsterdam to Constantinople. He wrote about the first leg of this journey years later in A Time of Gifts, ending the book as he crossed a bridge from Czechoslovakia into Hungary. In 1986, he finished this memoir of the second leg of the journey, which begins on that same bridge in Esztergom the evening of Easter Sunday and ends in the early autumn of 1934. In the second part of the journey, Leigh Fermor breaks his rule of making the entire trip by foot and also spends much of the time in more luxurious surroundings than he did in the first part. As he makes his way through Hungary and the Romanian border, as it was then, into Transylvania, he is passed by his growing list of acquaintances and friends from one kastély to another, spending days with a learned professor discussing languages and history, borrowing a marvelous horse from a count for part of the journey across the Hungarian plain, staying for weeks with a new friend named István in Romania, and dallying with a young married woman on a motor trip with István to Prague. Leigh Fermor does not spend all his time in such exalted circles, though. He happily camps out with gypsies, spends the night outside a shepherd’s cottage, is hosted by a Jewish family after an afternoon spent discussing the Hebrew language, sleeps in a cave, and camps on an island in the Danube near a village inhabited by resettled Turks. On his way, he describes the scenery in lyrical terms, explains the ancient history of each area he passes through, and tells us about the people he meets and the sights he sees. His chronicle is supported by the notebooks he kept and a nearly photographic memory of a remarkable journey. In addition, he tells us that he revisited some of the areas 20 years later. This memoir is beautifully written. Although relatively unacquainted with formal learning, having abandoned military school at that early age, Leigh Fermor has an astonishing range of interests, and he tells us all about them. He is constantly plunging into dusty tomes in his hosts’ libraries but is just as ready to dance and drink the night away. This is a delightful series of books, still full of the youthful joy and enthusiasm Leigh Fermor must have felt when he was 19 and 20 years old. 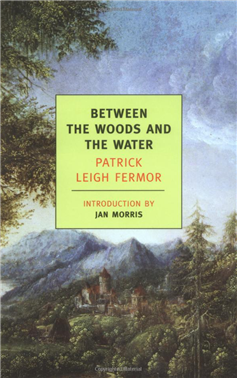 In the Appendix to this book, Leigh Fermor reflects on how many of the sights he writes about in this book are now under water, for the Danube valley that he traversed and the torrents and currents that once rushed along it as well as the Iron Gates themselves have been subsumed by a huge concrete dam and hydro-electric power plant. And of course there have been other causes of destruction since 1934. Unfortunately, The Broken Road, the unfinished manuscript of the final portion of the journey, is being republished but is not available from Amazon until March of next year! (It may be available used from some other site.) I am so disappointed to find the book never gets us all the way to Turkey but stops in Greece. In December 1933, nineteen-year-old Patrick Leigh Fermor set out alone on a great adventure, a walking trip from Amsterdam to Istanbul, or as Fermor still called it, Constantinople. (It was renamed in 1930.) He had no idea when he left that he would not return until 1937. In 1977, he collected his notebooks from the trip and wrote A Time of Gifts and its sequel Between the Woods and the Water. From his drinking bouts with Dutch barge men to his extended stays in various German, Austrian, and Czech castles, Leigh Fermor plunges enthusiastically into every experience on offer. At one moment he is sleeping in a barn, in the next hanging out with fashionable youth in Vienna. Along the banks of the Danube he is mistaken for a 50-year-old smuggler. All of these adventures as well as his observations of nature are described in beautiful, evocative prose. To add interest to the modern reader, he is describing a Europe that no longer exists. 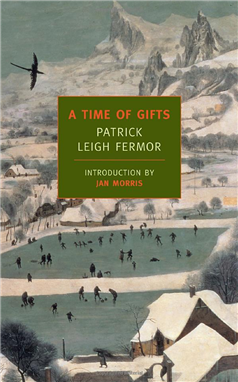 If I have any complaint, it is one of my own education, for Leigh Fermor’s writing assumes for his audience a familiarity with classical culture that is no longer common. The book often alludes to mythology and refers to obscure historical events that I do not fully understand. Finally, in the footnotes, which are Leigh Fermor’s original ones, all utterances in modern languages (some of which I could have taken a stab at) are translated, but the quotations in Latin are not. They are not integral to comprehension, but it is a little frustrating to be unable to understand them. (Of course, I could have googled them, but I was almost always reading this on the bus.) That being said, I look forward to reading the sequel. In A Walk in the Woods: Rediscovering America on the Appalachian Trail, Bill Bryson recounts his attempts to walk the Appalachian Trail. After living in England for years, Bryson has moved back to the States, and he decides to reacquaint himself with America and try to get into better shape by walking the trail. To his surprise, an old friend named Katz, a reformed drug user, decides to come along. Bryson is an amusing writer. He mixes interesting facts about the trail and information about the environment with stories about who he and Katz meet and what happens to them. I was particularly struck by how two such mismatched companions not only did not kill each other but actually treated each other considerately. The two out-of-shape and inexperienced hikers start out with far too much equipment and then as they continue, Katz begins throwing things out, including the food. It seems they make just about every mistake a couple of neophyte campers can make, except being eaten by bears. They run out of time after walking a few hundred miles of the trail in the south, and Bryson’s attempts to finish the trail devolve to what he can accomplish by driving to different portions of it and hiking on long weekends. But the longer hike that the two of them take is the meat of the book. 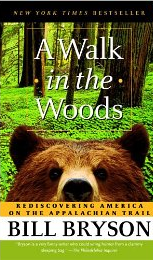 A few people have criticized the book because Bryson didn’t actually manage to hike the entire length of the trail. I think they are missing the point of the book, which is about friendship, about the interesting things that happen on the trail, and the history of the trail itself. In fact, few people do manage to complete the entire length of the trail, from Maine all the way to Georgia.